It feels like Christmas when you're holding a Champagne Cocktail and wearing a red sweater! 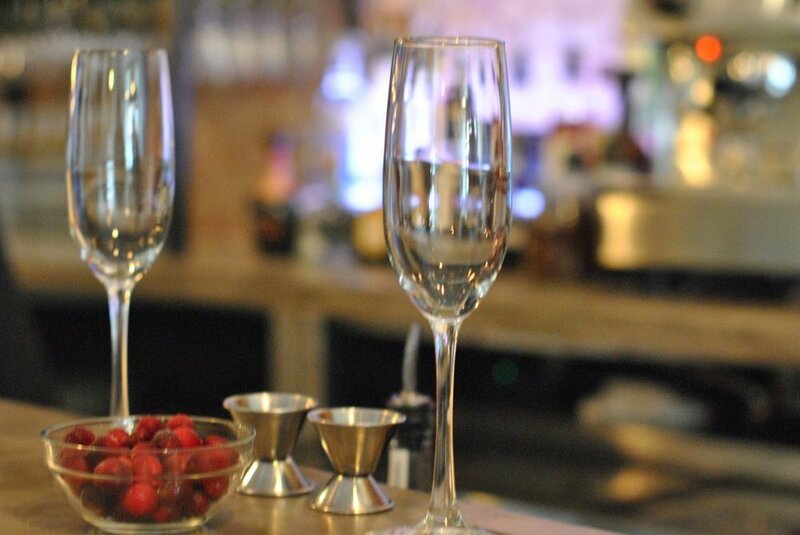 For my next video, I decided it would be fun to visit a local wine bar, Redefinery and learn how to make a show stopping Champagne cocktail! I wanted something easy, elegant and delicious! The very gracious bartender at Redefinery, Chris, taught me how to make the easiest and most delicious drink! Your guests will love it...after all, you can't go wrong with a bottle of bubbly! I certainly enjoyed playing bartender and drinking the delicious Champagne Cocktail! We made the Champagne Cocktail with Champagne, frozen cranberries, the best quality cranberry juice and limes! This is the scene in front of the bar while we were making the cocktail! I can't wait to share this video with you! Chris the bartender, prepping for the video shoot. I was getting a little too comfortable behind the bar! Banana Bourbon is another specialty of Redefinery. Bananas are soaked in bourbon overnight and then the bourbon is strained. It is an unexpectedly delicious drink and very beautiful with the big ice cube. My festive red sweater is by Joie (similar here) and my necklace is Chloe and Isabel. I had so much fun making this video and I can't wait to share it with you! Have a great day and thanks for stopping by Crazy Blonde Life!